Free apps are great, especially when they normally cost money. If they’re as useful and as popular as WhatsApp, well, that’s just a bonus isn’t it? Now the every-popular cross-platform messaging app WhatsApp Messenger for iPhone is free, you owe it to yourself to give it a whirl. According to the app developer’s Twitter account, the current super-bargainous free pricing is only a limited promotion, so if you’re on the fence about WhatsApp, now’s the time to download it before the price goes back up. Normally priced at $0.99, WhatsApp is best described as BlackBerry Messenger with the added bonus of being available for pretty much any smartphone operating system you can think of. Android, iOS, BlackBerry, and even Nokia are all supported, with messages and even video or voice able to be sent between platforms, and it’s all free. WhatsApp messenger is a cross platform smartphone messenger currently available for iPhone, Android, BlackBerry and Nokia phones. The application utilizes push notifications to instantly get messages from friends, colleagues and family. Switch from SMS to WhatsApp to send and receive messages, pictures, audio notes, and video messages at no cost. All features are included without the need for extra in-application purchases. So what are the downsides? 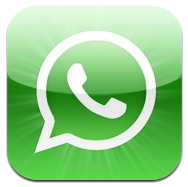 Well, WhatsApp will need your phone number so it knows where to route messages to and from. That could be looked at as both an advantage and disadvantage though. While some might not like sharing their phone number, it also means users don’t have yet another account to create, no new usernames or passwords to remember. Once you get over the idea of sharing your phone number (and why wouldn’t you? We share Gtalk usernames, email addresses all the time) you’ll love the idea of sending photos, video and audio as well as good old text for free. No more international SMS charges! Have you downloaded WhatsApp Messenger yet?